March is Nutrition Month, so we have selected a simple recipe that is filled with nutritious ingredients that you may not readily have in your home. We encourage you to cook outside of the box for the month and try some foods that can bring some variety into your diet as well as your pantry. This easy to make recipe is great for an afternoon snack, or anytime you need a boost of energy. Make double the recipe and save it for later too! Goji Berries - Tender, juicy, filled with antioxidants, fiber and protein. Cacao (aka chocolate) - Magnesium, calcium and a source of energy. Hemp Seeds -loaded with omega 3's and fiber. Sea Salt - We all need a little salt in our diet. It also makes sweet tastes sweeter! Cinnamon - natural food preservative, lowers cholesterol and adds ...well cinnamon's distinct flavour. Combine the oats, oat flour, banana powder, coconut sugar, coconut oil in a bowl and combine until the coconut oil is melted in. Bake in oven for 15 minutes, stirring once part way through. Remove from oven and allow to cool for a few minutes. 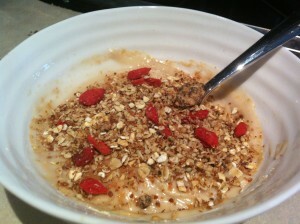 Place baked oats in a large bowl and combine with hemp seeds, cacao clusters, goji berries, cinnamon and sea salt.